The River 68's were first up. This was a bit of a surprise as all the advertising and even the venue website only mention LostAlone as support. The River 68's are a Scottish duo (of two brothers) from Glasgow. One sits and plays acoustic guitar, harmonica and stomp box and the other stands and plays acoustic guitar. They play acoustic rock and roll and despite only having a short set they manage to get the crowd warmed up nicely and they go down well with the crowd. LostAlone were next up. I've seen them before in a small venue a year or two ago, but tonight they are far superior in every way and are clearly responding to the large crowd as they put in a superb high energy performance. At one point the guitarist jumps down off the stage and climbing onto the barrier carries on playing as he leans back into the crowd. They may be a three-piece but they move around so much that it feels like there are more of them. It's a great set and they go down very well with the crowd. 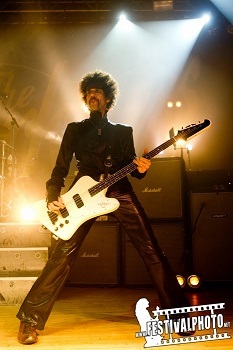 Tonight the Darkness split their set into two shorter sets with a few minutes gap between them. The first set was various songs and the second set was to be "Permission to Land" performed in it's entirety. And of course the obligatory encore to follow all that off. 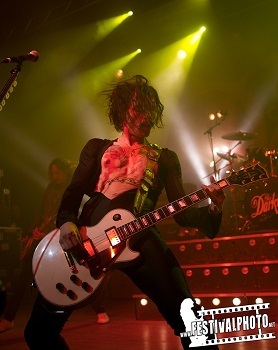 This was my first time seeing The Darkness perform live. Obviously I knew quite a few of their songs - the singles in particular, but I'd never got to see them live before tonight. The band came out after the intro tape and stood lined up across the stage before grabbing their instruments and getting things underway. Straight away I was impressed - while I think the band have always had great songs I've never been a fan of Justin's falsetto vocals, but live the vocals sound much better and I'm really able to enjoy the songs a lot more. During the first set they include a cover of the Radiohead song "Street spirit". They do a good cover of it, but personally I think the cover of the same song by Stream of Passion is far superior. Ending the first set with "One way ticket", they end it on a real high note before disappearing off-stage for the very brief interval. Within a few minutes they're back on stage with Justin having swapped his black catsuit for a black and white striped version, and they're straight into the Permission to Land set. Needless to say the highlight for many fans is the single "I Believe in a Thing Called Love", but the whole show goes down a storm in this packed venue. For the encore we get the Christmas single - Christmas Time (Don't Let the Bells End). It's a great end to a great night.